The first affiliate marketing networks opened their doors in 1998. They have provided some essential services, but also created a lot of bureaucratic red tape and costs for advertisers and affiliates alike. Attrace is a revolutionary network that is using blockchain to address these drawbacks. Blockchain is the technology that was developed to authenticate bitcoin transactions. It is also increasingly being used in other industries, including financial management. Attrace has found a use for it in the affiliate marketing industry as well. 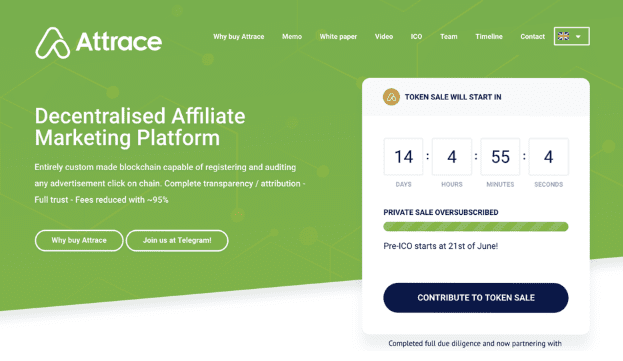 Attrace is a custom blockchain solution that was developed specifically for managing affiliate marketing relationships. Blockchain has helped dramatically improve the efficiency of many functions traditional affiliate networks struggled with. It has made decentralization possible, which is a step that both affiliates and advertisers are celebrating. Here are some of the main reasons it is disrupting the industry in positive ways. Affiliate networks offer valuable services, but they charge a hefty premium. Advertisers need to pay between 15% in 25% of the revenue to the network. This drives up costs and reduces the commissions they can offer to their publishers. Attrace has used its cutting edge blockchain solutions to reduce infrastructure costs by automating many of the tasks that used to be handled by human employees and cutting the prevalence of fraud. The network has passed these savings along to their customers. The network fee is only 0.5%, which is 95% lower than the industry average. Cash flow is very important for affiliate marketers. It is even more important if you are using paid traffic, because you may run out of funds as soon as you have a profitable campaign that you need to scale. This can be incredibly frustrating if you need to wait a couple of weeks to get your next check. Since most networks pay on a net 30 basis, this problem happens more often than we would like. Some networks like PeerFly allow affiliates to get paid early, but they must forfeit a percentage of their commissions for the privilege. None of this is a concern if you are using Attrace. Since this network uses blockchain over traditional payment gateways, it is able to process payments much more quickly. They are the first network I have seen that allows affiliates to get paid in real time. If you need a steadier cash flow, this is a lifesaver. Affiliate fraud is a serious problem these days. Unscrupulous affiliates can use fraudulent contractors on Fiverr and other platforms to fraudulently enter leads. Some have even gone to the extent of using stole credit cards or cookie stuffing to get paid for sales they did not earn. Shawn Hogan is one affiliate that was recently sentenced to prison for stealing nearly $30 million in eBay commissions. Affiliate networks have been searching for new ways to combat affiliate fraud for years. Attrace has made a remarkable breakthrough. Their breakthrough blockchain solutions have made discovering affiliate fraud easier than ever. This is going to reduce the number of illegitimate leads and help purge unethical affiliates from the network. This isn’t just good news for advertisers. Legitimate affiliates should celebrate as well. The costs of cookie stuffing and lead fraud have forced advertisers to lower their commissions for honest affiliates. By fighting these problems, they will be able to increase payouts while using the Attrace network. You have probably noticed that the number of clicks registered on your affiliate network don’t usually match those in your third-party tracker or those reported under the advertising platform that you are using. There could be a number of reasons for this. One reason is that clicks often get accidentally dropped from the network, because of limitations with their own internal tracking system. This is obviously a huge problem for affiliates, because it means they aren’t getting paid for some conversions they have probably earned. If you are using paid traffic, this could possibly make the difference between making a net loss or a slight profit. Attrace has found an ingenious solution to this problem. They embed a smart contract in every single click. This means that every click is guaranteed to be reported to the network. It will help you significantly improve your ROI. Using networks as intermediaries can create a variety of issues. The biggest issue is that affiliates and advertisers rarely have any direct communication with each other. This can lead to some misunderstandings when an affiliate needs to request permission to run a new traffic source, get a custom creative approved, ask for a payment bump or a number of other things. These requests also need to be relayed through multiple channels within the network, which can take a lot more time than is necessary. Attrace has eliminated the middle man in a lot of ways. While the network still acts as an intermediary, most of the communication is conducted between the advertiser and the affiliate, rather than being passed from an account manager and affiliate manager. This reduces the bureaucracy and creates more transparency between all players. This reduces the likelihood of expensive misunderstandings and provides more seamless communication.